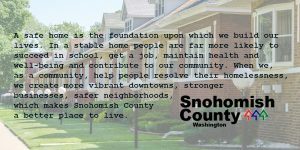 We were delighted to find in our inboxes an email from the Snohomish County Human Services Department (SCHSD) sharing an excellently-framed op-ed, “Commentary: Joint efforts building solutions to homelessness” in the September 30, 2018 edition of the HeraldNet of Everett, Washington. The op-ed was authored by the Community Services Advisory Council (CSAC), an advisory board to SCHSD on issues concerning individuals with low incomes and in poverty. We recently spoke with Tyler Verda, Human Services Specialist at SCHSD, about its and CSAC’s experiences with reframing. SCHSD and CSAC first learned about reframing at a National Reframing Initiative presentation and training at the Washington State Community Action Partnership conference last year. Staff brought reframing back to their organization and gained agreement to start implementing it. Additionally, framing has been helpful to CSAC in advocating for individuals with low incomes and raising awareness of the critical role human services play in allowing everyone to further reach their potential. SCHSD and CSAC also plan to use reframing in a Low Income Community Needs Assessment that will inform planning, program development, and funding. SCHSD and CSAC have found the Building a New Narrative on Human Services Communications Toolkit especially helpful—sharing it with colleagues and community partners. In crafting the op-ed, Verda said CSAC found the FrameWorks Institute’s sample editorial particularly useful. He finds examples that the Reframing Network Newsletter features of other organization’s well-framed communications relevant too. Verda even posted the Human Potential and Construction Metaphor message cards at his desk. In general, “the reframing tools help the difficult task of messaging complicated human services programs in a way that the general public will appreciate,” Verda observes. “Joint efforts building solutions to homelessness” does a nice job of applying the Building Well-Being Narrative and other important framing strategies throughout the commentary. Using the Building Well-Being Narrative: The op-ed opens with the Value of Human Potential by mentioning outcomes such as individual milestones and thriving communities. It also embeds the explanatory Construction Metaphor by using the terms foundation, tools and building in reference to well-being and a flourishing community. For instance, the commentary observes: “We understand that just as building a sturdy house requires the right tools, so does building a healthy community.” It even uses “building solutions” in the title. The op-ed also touches on the life cycle by referring to households (i.e., people of different ages) and “family crisis” as a risk factor for homelessness. Prioritizing Explanation of Systems Over Crisis for Individuals: Instead of using crisis language that can induce hopelessness that there are no solutions, the op-ed offers very good explanations of the systemic drivers of homelessness, including high rents and insufficient wages that divert blame away from individuals that the public can sometimes default to. Similarly, the op-ed does not refer to “homeless people” but uses person-first language with descriptions such as “1,150 people resolved their homelessness with assistance.” This avoids othering or priming people to rely on their assumptions about people who are homeless, such as they lack discipline or drive. Focusing On Solutions and Conveying Pragmatism: Finally, the op-ed focuses on several proven systemic solutions to address homelessness, such as supportive housing, and refers to the diverse partnerships and bipartisan efforts that are leading those efforts. The commentary carefully connects the solutions to address homelessness with its causes and the needs of people who are homeless (e.g., affordable housing, mental health treatment and other health services). In that vein, the op-ed adopts a pragmatic and can-do tone that also reduces a sense of fatalism among the public that nothing can be done about the problem. It also, whenever possible, uses plain language, not jargon (or explains what sector terms such as supportive housing and rapid rehousing mean) so readers can understand the terms and issues at hand. As a result of the op-ed, Verda reports that policymakers commented appreciatively that CSAC is spreading awareness of how impactful human services are in the community. Community partners also said they were pleased that the op-ed was solutions-oriented as opposed to crisis-messaging focused.